Monty Metallic dog collars have a subtle sparkle combined with a sleek python print. This design has the heart of rock and roll and the soul of fashion. Choose from the rich tones of Graphite, Rose Gold or 24 Karat Gold. We have had a large number of requests for martingale collars and extra wide collars, and here they are! Our Mandala Star Collection is inspired by our favorite things: Italy in the summer, vibrant gem stones and French art deco designs. Choose from 3 distinctive designs (Tuscan Lemon, Carnelian Red, and Parisian Deco). This fabulous collection is available in both a martingale style collar or standard collar with aluminum side-release buckle. Our Kashmir Collection is inspired by the intricate and ornate patterns found in the tapestries and architecture of the Near East. Choose from 3 distinctive designs (Peacock Blue, Turkish Teal, or Temple Red). Select from a martingale style collar or standard collar with aluminum side-release buckle. Why Choose A Martingale Collar? Martingale Collars make great safety collars for dogs and help with control and pulling on leash. 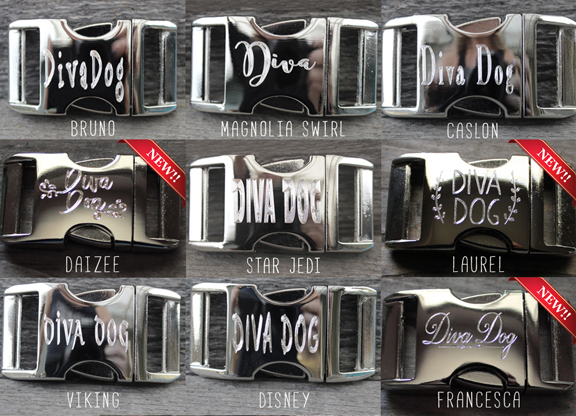 They are the preferred collar of rescues and dog trainers. A well-fitted martingale collar is perfect for dogs with narrow heads, such as Greyhounds, Dachshunds & Collies, or for rescues and timid dogs that can back out of regular collars when on leash. • We use diamond engraving, which is permanent, unlike laser engraving which can rub off because it is applied to the top of the surface instead of etching into the surface. • Diamond engraving is precise, and leaves clean lines for a finished look. • Putting pets information on the collar, instead of a tag that can fall off, gives an added layer of safety if your pet becomes lost. Choose from 8 fonts. You can add up to two lines of type 25 characters.